In early January my old friends Randall Homan and Al Barna called to see if I wanted to go out for a night on the town. They have a book out, San Francisco Neon: Survivors and Lost Icons, which features their beautiful photographs of the city’s neon signs, so for them, getting out often involves supporting a business with a legacy neon sign. 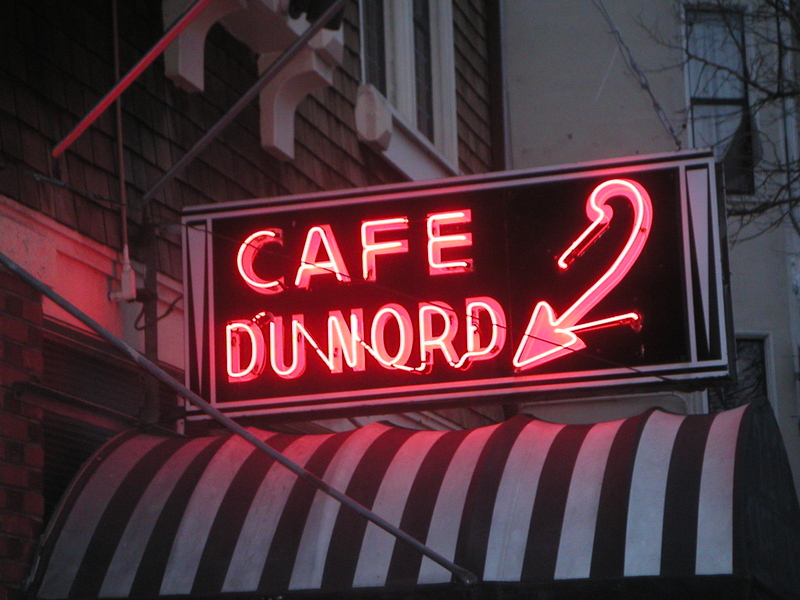 This time they had their eye on Café du Nord, on Market Street, with its swoosh-like neon arrow pointing downward, a shimmering promise of under-worldly gastronomic pleasure. 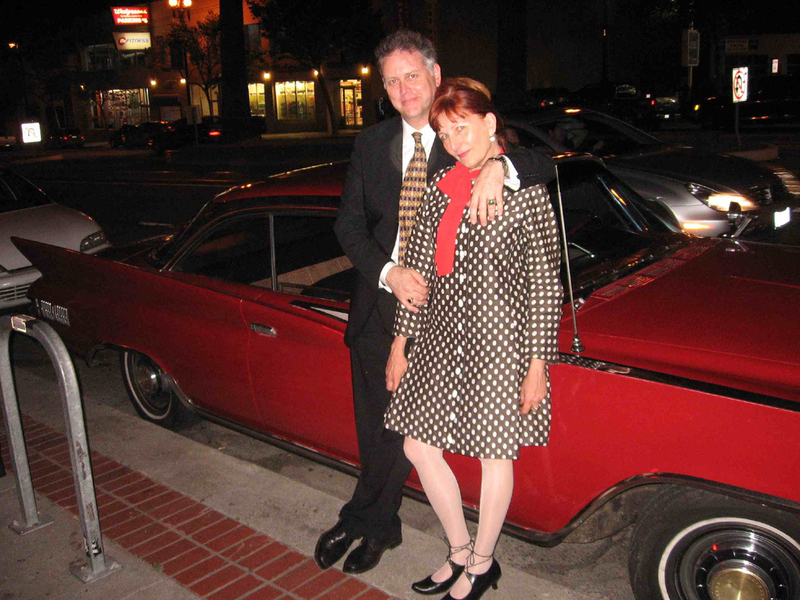 They would also see if Eddie Muller, kingpin of the annual San Francisco Film Noir Festival, and his wife, Kathleen Milne, could join us. Say no more was my reply. 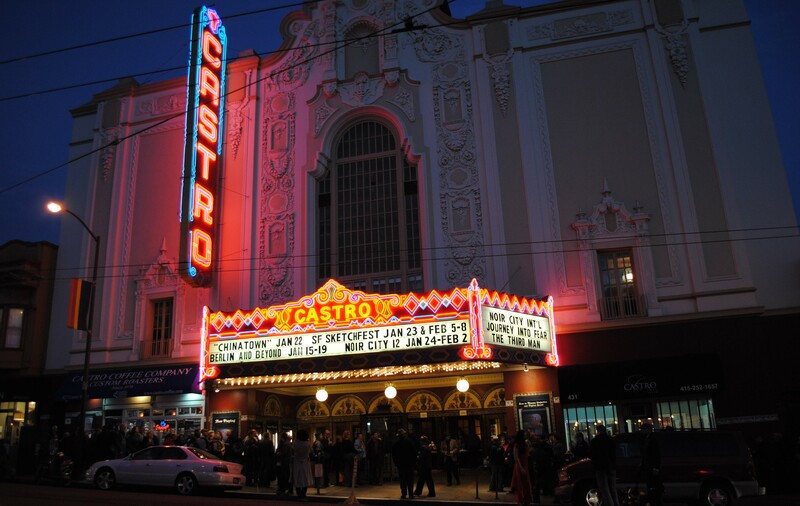 The 14th Annual Noir City Film Festival SF at the Castro Theatre was fast approaching [Ed. note: The festival opened Jan. 22 and continues through Jan. 31], so I reckoned it extremely unlikely we’d actually find Eddie free on a Friday night. Al, Randall, Kathleen, and I were already at the bar when the Czar of Noir made his entry down the staircase. Eddie looked like a character from a 1940s movie, though not necessarily a noir hero. He has an aura of authority about him. Smart, good-natured, ready for anything, occasionally dropping hard-boiled, mid-century expressions into a steady flow of patter. Photo by Randall Ann Homan. We ordered a round of No. 209 gin cocktails to start with as we each assessed the cleverly folded cardstock menu. I had first considered ordering a “Roscoe Fatty” – a du Nord original, honoring Fatty Arbuckle, with bourbon as the main ingredient – but I’d recently gone on a diet: I no longer take honey with my booze. Du Nord’s menu is built around the cocktails and food that emphasizes seafood and American classics. I noticed lots of snacks and small plates: crudo, raw oysters, pickled beets, beef tartare, bar nuts. There were just four enticing entrees: burger, seafood cioppino, chicken al Mattone, braised lamb shank. We ordered all of the entrees but the lamb, which I now regret, as everything else was good. The cioppino was a big success. The burger was nearly overpowered by the slab of cheddar on top, though it was of very high quality. We started out discussing a short film by Al and Randall that Eddie plans to screen during this year’s festival. It’s a five-minute montage of neon in noir films, expertly edited and accompanied by the recording, The Stolen Moment, by the Eddie Lockjaw Davis big band. (If you happen to be at the Friday Jan. 29 screening of this special feature before the 7:15 p.m. showing of The Bad and the Beautiful, as you identify the films and the actors each scene comes from, be sure to also pay attention to the way the neon signs enter and leave the frame; Eddie hadn’t chosen a night for it yet, and he had some suggestions on how to shorten it, so he could fit it in between the organ music and the feature film.) As our table conversation settled into a comfortable rhythm, Eddie put his hand over Randall’s phone, with which she was recording the conversation, and informed me that what he was about to say was “not for attribution.” Occasionally throughout our chat he would do this as the conversation veered off subject, or into areas he considered too saucy for print. About this particular aside, I believe I may share that it was local, it involved someone he knew a long time ago, and that in the story she meets a sordid end. 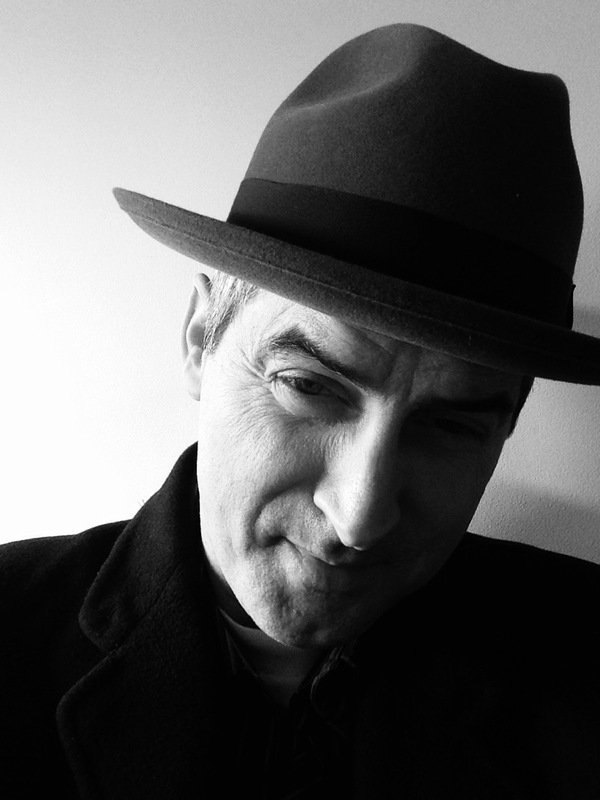 The Czar of Noir walks the walk and talks the talk. 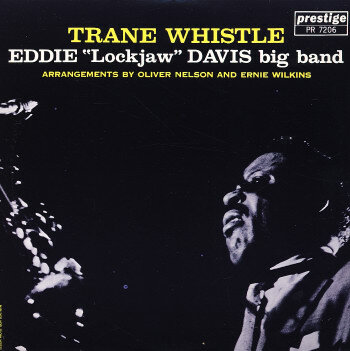 Eddie frequently glanced over at Kathleen, who was probably the quietest, most astute person at the table, and whose opinion Eddie clearly values. 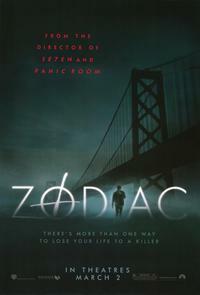 If he is uncertain of the direction his thoughts are taking him, Eddie may glance over at Kathleen, and she may indicate through some subtle gesture, undetectable to the rest of us, that Eddie picks up. At one point he told us she had just rolled her eyes; no one else had caught it, but for Eddie it was cause to back up and rephrase his last few sentences. This year’s festival will include The Bitter Stems (Los Tallos Amargos; 1956; it screened Jan. 23), a noir film from Argentina that was restored through a partnership between Eddie and Fernando Pena, an Argentine film archivist. According to Eddie, this film is just the tip of the iceberg of classic Argentine film, but many of the pictures are in need of restoration, and for some, time is running out. He described the planning of a film festival’s program as a design to spark maximum offense. “A Thursday night crowd is going to be up for anything. That’s the night for borderline films. I might do a ‘bad girl’ film, or movies that are more sensational. Friday night, it’s a big night out, there’s a little more pressure. You play it a little safer.” Some movies need the right conditions, others may do just as well on a Monday as on a Friday. During Noir City 4 or 5, I was sitting up in the balcony of the Castro Theatre. After introducing the film, Eddie stepped down off the stage, walked up the aisle and disappeared into the lobby. As the opening credits finished, he reappeared right behind me and took a corner seat in the very last aisle – some would say it was the worst seat in the house. But the beam of light shot out over the crowd, the movie illuminated the screen, musical flourishes soared into the rafters, dialogue crackled, and there was a steady murmur from the seats, a collective responsive rumbling as the film was being consumed and digested appreciatively by the house, and there was Eddie, slouched in his seat, taking it all in. Over coffee we got Eddie talking about past festivals and some of the noir icons he has known. Jack Palance, Richard Widmark, to name a couple of big stars. I asked him about Lawrence Tierney, the star of Born to Kill (1947), whose career nosedived in part because of his off-screen penchant for drunken brawling. I already knew Eddie had a good story about Tierney, as a friend had heard it and relayed it to me. Eddie recognized the bait and hesitated. “I’ve told that so many times I finally decided I’d better write it down.” But he couldn’t help himself and told it to me anyway. 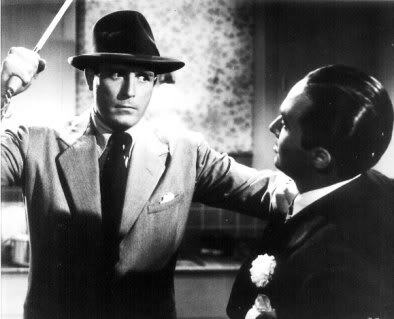 Lawrence Tierney in Born to Kill. It’s up on Muller’s website, but the gist of the story is that Muller hosted a screening of Born to Kill at the Egyptian Theater in Los Angeles. Director Robert Wise had been invited as a special guest. Tierney hadn’t been invited, but showed up anyway. It turned out Tierney had been banned by the theater, for bad behavior. Muller insisted that Tierney be allowed to watch the film and agreed to baby-sit. In the lobby, before the film, Muller and Tierney ran into Wise outside the men’s room. “I thought, this is great, I’ve got the director and the lead actor of the film here together, let’s see what they have to say,” Muller recalled. “So Tierney reaches out his hand, grabs Wise by the throat, and shoves him up against a wall. He’s throttling him, and he says, “I’m directing YOU now, Bob!” Then, during the screening, in a full house, Tierney relieved himself into an empty plastic cup. The sound was unmistakable to anyone within earshot. Tom Downs is the author of Walking San Francisco (Wilderness Press) and an award-winning edition of Lonely Planet’s New Orleans, along with many other books and articles having to do with places, culture and history. Visit TomDowns.xyz/. 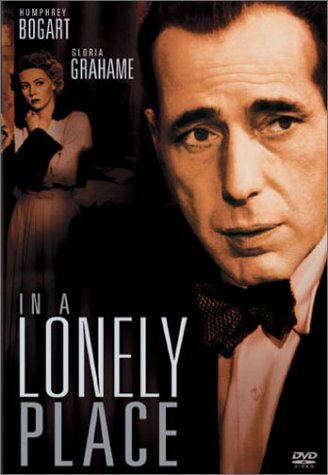 This entry was posted in Films, Films: Classics, Films: Festivals, Films: Noir and tagged Al Barna, Castro Theatre, Eddie Muller, film noir, Films, Randall Homan, San Francisco Neon: Survivors and Lost Icons, Thomas Downs. Bookmark the permalink.